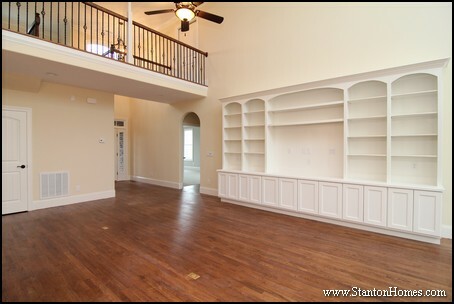 Built in bookcases will add a ton of character - and practical storage space - to your home. 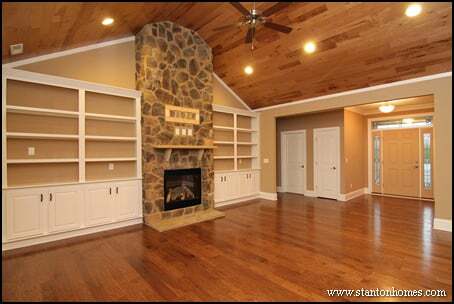 Popular locations for a built in bookcase include: surrounding the living room fireplace in, along a wall in the great room, inside a hallway, added to a home office, and tucked into a bonus room. When considering the layout of your living room, it's important to keep in mind that the fireplace wall will offer limited space for furniture placement. 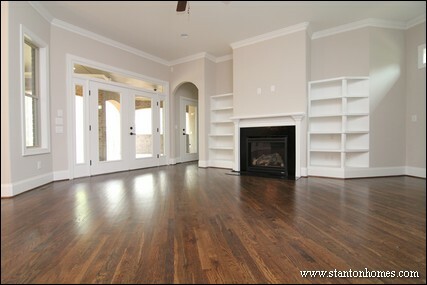 This makes the fireplace wall an ideal space for built-in bookcases. 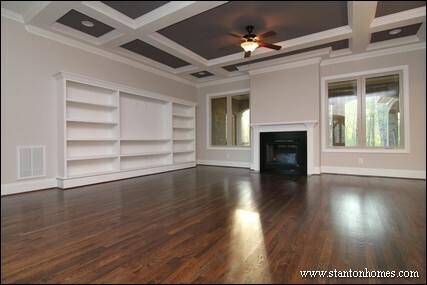 In this Raleigh custom home, the upper and lower bookcases are staggered, offering a combination of shelving and display options. These bookcases offer storage inside, and they leave enough space above for decorating with tall items and artwork. These bookcases are symmetrical, but not identical. 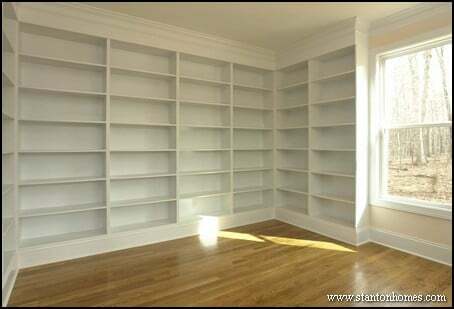 The right-hand book shelves are angled, for a custom fit to the space. This design maximizes storage space, and leaves the room open. 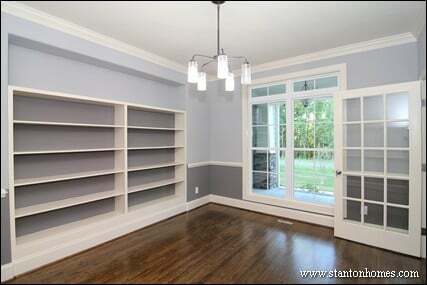 Painting the backs of your bookcases will help them blend into the room, and make the trimwork "pop". 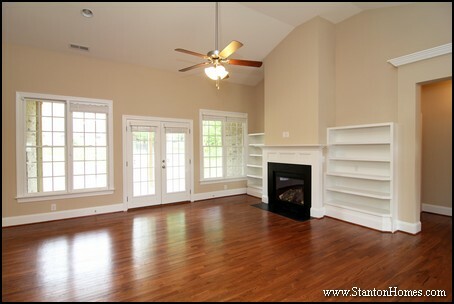 In this Raleigh custom home, the main wall color extends into the bookcases, creating a more integrated feel. This design trick works especially well in rooms with darker wall colors, which contrast heavily against white bookcases. 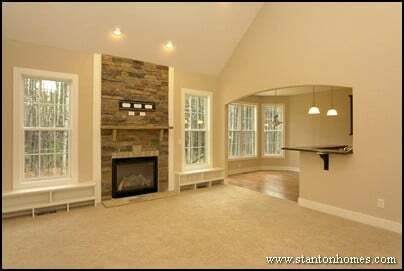 Many popular floor plan layouts incorporate windows on each side of the fireplace. If you want to keep natural light flowing into your great room, consider adding your built-ins to another wall. 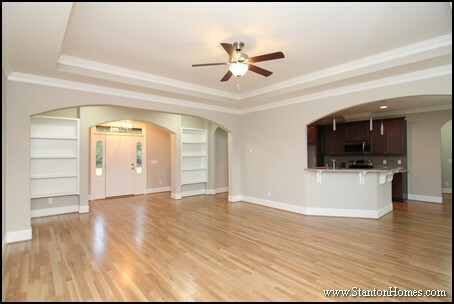 Open concept floor plans, like the one pictured below, offer more flexibility in where you place the built-in bookcase. In this Chapel Hill custom home, the bookcase wall sits opposite the fireplace wall. Keep in mind: a minimum three foot walkway is recommended between your furniture and the wall. This bookcase was custom-designed to include a piano niche. If you love built-in storage solutions, consider converting your bookcase into a full entertainment center with flat screen TV placement. These built-in bookcases play peek-a-boo with different lines of sight. 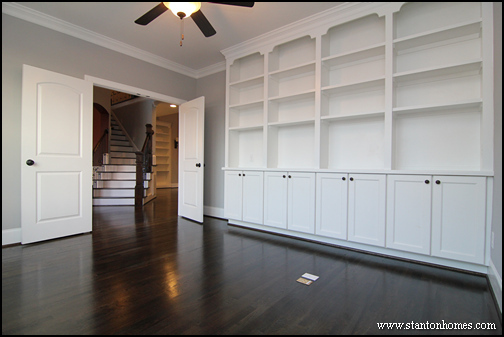 While these built-ins are located front-and-center, hallways are a great place to tuck bookcases designed for out of sight, but easily accessible, storage (for things like games, movies, and other items not intended for decoration). If your home office is more formal, consider using two paint colors. The lower color should be darker, and the upper color lighter. When painting the inside of your built-ins, the color is your choice, depending on how dramatic you'd like the room to feel. Another way to add formality to your office is by adding flourish to the bookcase trim. Lower cabinets will hide away more confidential items, while open shelves will offer ample storage. Can't get enough storage? Consider wrapping two or three walls of your office in open shelving. This study is a book-lover's dream. Love to play games? 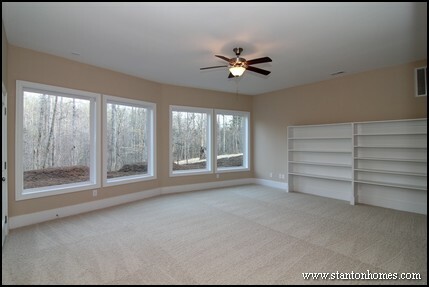 Then your bonus room or basement will need plenty of storage space. Consider the ease-of-use these open shelves provide. 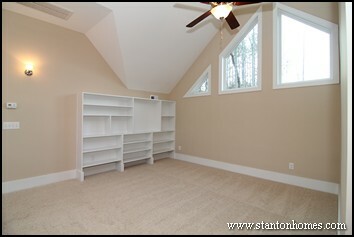 The loft is another great place to tuck a built in bookcase. Lofts are generally out of sight, making the use of your bookcases more flexible. 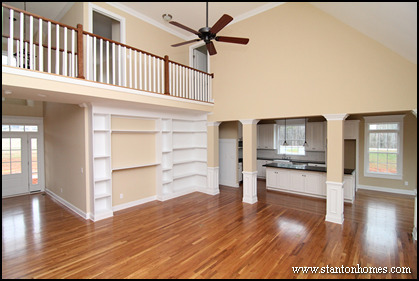 When you build a custom home, you can add storage centers to all your favorite locations throughout your home. Have a floor plan you love? Stanton Homes can give you some great ideas for how to stack, place and arrange built in storage to suit your lifestyle. When Should I Eliminate the Kitchen Island?